The economic and financial crisis that started in 2008 seems to be on its way to being overcome by many EU member states, but the population in some of the most touched countries is still labouring under the ongoing effects of the slowdown. Latvia, which underwent an annualised decline of 18% of GDP in the first quarter of 2009 and still has the highest unemployment rate in the EU, is experiencing a veritable revolution in its population structure and is preparing to face serious demographic challenges. The strong recession experienced in the last few years has sadly confirmed the high propensity of Latvian people to migrate for economic reasons and generated a real “exodus” of working age population. Before 1999, a peak of emigration was registered due to the endogenous migration potential of the collapsed Soviet Union, but, from 1999 to 2002 the outflows seemed to stabilize and to show a slowing trend. This trend changed with the accession to the European Union and the immediate application of the free movement of labour by UK, Ireland and Sweden, which decided to open their borders to New Member States immigrants without any transitional restrictions. These conditions created an increase in the number of emigrants in 2006 and the “old” member states definitely replaced the Russian Federation and the ex Soviet Republics as main countries of destination. The decline of the outflow in 2007 is linked to Latvian extraordinary economic growth which appeared to guarantee an increase in the wellbeing of the population. This situation started to deteriorate in the second half of 2008, generating a new rise in emigration decisions and increasing more and more in the following year. Net migration has always been negative and, combined with a Total Fertility Rate among the lowest in EU, it strongly contributed to a progressive and continuous decline of the total population. More recent data were collected through the EU funded project The Geographic Mobility of the Labour Force , consisting of a survey conducted in 2007. The study arrived at the conclusion that a bit more than 40˙000 people emigrated between 2004 and 2005 (87% more than registered data). 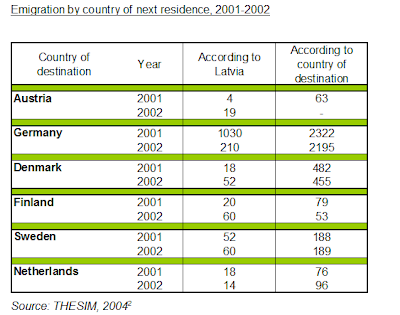 The authors forecasted that intensive emigration was expected to continue and that, looking at the number of respondents who said that they wonted to leave and at those who already did something in pursuit of this dream, by 2010 between 10˙000 and 16˙000 people were supposed to leave Latvia, thus totaling 50˙000 to 80˙000 emigrants from 2004 to 2010. These estimates were presented in 2007 when Latvia was going through a period of sustained economic growth and no one could even imagine the economic collapse which the country is undergoing in this moment. The survey, which I personally conducted in Riga from September to December 2009 and which involved some of the major Latvian experts on migration issues, showed that around 30,000 people are supposed to have left Latvia in 2009 and the same number is forecasted also for 2010. These massive emigration flows from Latvia can strongly affect the future demographic and economic structure of the country, creating serious problems of labour shortage, unsustanability of the pension system and huge population decline. Since the years of great economic growth, Latvia experienced a huge problem of labour shortage due not only to the lack of high skilled professionals but also to the general discrepancy between demand and offer of labour. In 2006-2007 this situation was one of the main topics of political and public debate and, under the pressures of the enterprises, the government approved a more liberal immigration policy in order to select labour force from abroad. The downturn of 2008 caused an inversion of the trend: enterprises were obliged to reduce the labour force and the employment rate decreased together with the level of wages. These elements represented the main push factors for emigration and they are currently generating a real “exodus” of the labour force, creating dangerous structural problem in Latvian economy. Actually, lack of labour and especially of high skilled professionals will be a veritable challenge for the economic recovery of the country and nowadays it is one of the main reasons of concern for Latvian politicians and intellectuals. - the most part of the outflows consists of working age population (from 15 to 65 years old) that includes people in reproductive age (from 15 to 49 years old). A huge number of emigrants in this particular age group means a further reduction of the natural increase of the population. In fact, they will probably have their children abroad or the migration decision itself will discourage the creation of numerous families. This situation has to be combined with the low levels of Total Fertility Rate which characterize the country since more than 20 years ago. In Latvia, the first demographic transition to a rational regime of reproduction began at the end of XIX Century and the total fertility rate was lower than the replacement level already in the second half of the Century, due to repressions and harsh living conditions during the wars and the Soviet occupation. The replacement level was met only in the 80s after the introduction of partially paid child birth leave. Since then, the birth rate has decreased to unprecedented level and has represented an issue of serious concern for Latvian government. In particular, the decline of total fertility rate accelerated during the economic and political transition, since the Soviet centralized welfare collapsed and the national government opted for a shock therapy instead of a gradual and progressive transition to the market economy. However, Latvian government recognised the need to ensure reproduction of the population as a prerequisite for the nation’s existence and started to evaluate adequate tools for family support. The adoption of successful family policies made the birth rate level stabilize since 1999 and start to increase at the beginning of the XXI Century. Anyway, the total fertility rate never reached the replacement level and it is still among the lowest in the EU (average 1.4 children per woman in the period 2005-2010 ). As a consequence of these indicators, Latvian population dropped from 2.5 to 2.2 million people in 15 years and the negative growth rate is expected to accelerate in the next years. The experts interviewed in the last months of 2009 proposed different solutions to both economic and demographic challenges but they agreed on the fact that a more liberal immigration policy might be really helpful to solve problems of labour shortage and pension sustainability as well as to contribute to the inversion of the negative demographic trends. However, this proposal, which is one of the main topic of public debate since the economic boom, is in direct conflict with the hostility of national population toward immigrants. Latvian critical historical experience with integration of different ethnicities is the clearest explanation of this hostility and probably some years are still needed to overcome these cultural barriers. In definitive, the results of the survey allow to conclude that Latvia needs some important structural reforms (concerning an efficient social policy, a comprehensive population policy, a strong action against corruption and a reduction of the bureaucratic burden) to be implemented by the national government in order to prepare the country to play its role at the European and international level and to take the best advantages from the opportunities provided by the integration and globalization process. The first step to achieve this objective is the promotion of a cultural change whose main goal is to dump the “dependency from the past” and to open mental and factual borders to modernity. I really like that net migration chart. It is very effecient in allowing comparison of the three datasets; the visual layout is very intuitive to the eye. Of course, net emigration in a downturn is generally not surprising. What you have not mentioned in your post is, what the impact is on the Latvia/Russian ethnic make-up in the country's population. Do the (stateless) Russians without Latvian citizenship have access to Latvian travel documents/foreigner's passports and do they have the right of abode in other EU countries on a par with naturalized citizens? Various ethnic groups do normally not show the same propensity to migrate.